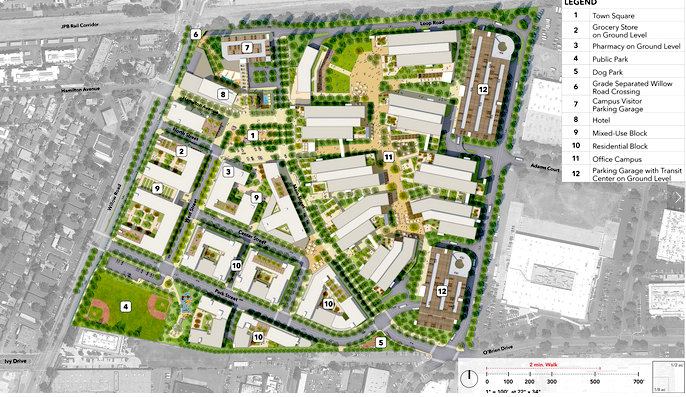 After disappearing from the public eye for just under a year, Facebook today (Feb. 8) submitted new plans to Menlo Park for its Willow Village project, which would be the largest development in the city’s history. The project, slated for 59 acres at Willow Road and the Dumbarton rail line, has changed slightly from the original July 2017 proposal. The proposal still consists of 1,500 homes, up to 200,000 square-feet of retail space, a hotel and 1.75 million square feet of office space are the same from when the project was proposed in July 2017. But the campus layout has been changed from the earlier version. It now includes a large public park and field just behind MidPen High School. Facebook is also proposing to include a “town square,” a community center and a dog park. Facebook released this illustration showing how the campus would be laid out. “Certainly there are great benefits in this project, but there are also complex challenges,” Mueller said. The complete set of plans have not been posted on the city’s website yet, but a map and some photos of the project can be found at willowvillage.com. 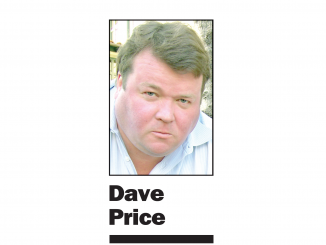 The project proposal submitted to the city says Facebook anticipates a full-service grocery store, pharmacy, restaurants, entertainment venues, a barber or hair salon and other shops will make up the ground-floor retail in the mixed-use buildings that will be on the Willow Road side of the campus. However, the grocery store and pharmacy that Belle Haven residents have long been waiting for may be among the last part of the project to be built. The mixed-use buildings, slated to be closer to Willow Road, will be between 55 and 85 feet tall, while the office buildings, closer to the East Palo Alto side of the project, will be up to 110 feet tall, according to the project proposal. No additional housing has been proposed as part of the resubmission for the project. 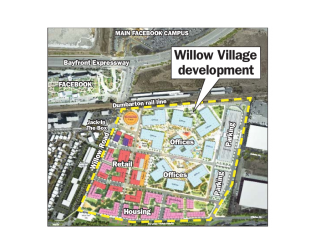 When asked why that was the case, the spokeswoman for the project, Christie Farrell, reiterated the fact that Facebook is proposing 1,500 homes as part of Willow Village. However, the city’s online project page notes that it may be a “minimum” of 1,500 homes, possibly leaving the door open for negotiating more housing. According to the project proposal, 225 of those homes will be reserved for low-income households and seniors. These appear to be the same homes Facebook promised the city after it got approval in 2016 for a 1.3-million-square-foot development on Constitution Drive. Yet this project, with 1.75 million square feet, will result in 7,000 jobs (if you use the standard benchmark of 1 job for every 250 square feet of office space). Mayor Ray Mueller said that while a lot of housing is proposed for the area, it’s likely the council will look into whether there ought to be more housing as part of this project. “The idea is to meet with all community stakeholders so we can identify and crystalize the things we need to drill in on over the next year,” Mueller said. But as with any construction project in the area, folks often wonder how it will affect traffic. The two employee parking garages will have 3,000 parking spaces in all, according to project plans. Each garage will also have a “transit hub” where shuttles and trams will congregate to move employees between campuses or throughout the Willow Village. The proposal says Facebook is proposing less parking in order to encourage employees to use company shuttles, bikes and public transit rather than their cars. The project proposal says it may run community shuttles between Willow Village, the Caltrain station and nearby neighborhoods. 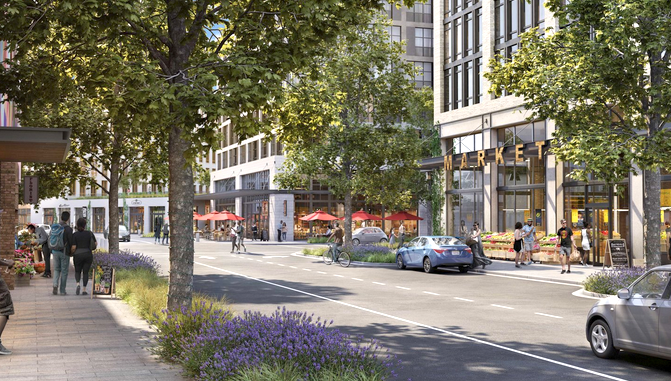 The proposal also says that the village “incorporates strong bicycle and pedestrian connections” to Facebook’s other two campuses. While an environmental impact report will have to be completed, Facebook’s proposal appears to predict that traffic may not be changed that much as a result of the project, despite an estimated 7,000 employees coming and leaving work each day on Willow Road. “As a mixture of office, residential and retail uses, the mixed-use Willow Village will have an inherent reduction in vehicle trips during the morning and evening peak periods and throughout the day. These trip reductions are due to synergy between the various uses that eliminate the need to travel long distances to jobs and services,” the project proposal says. As part of this project, Facebook is also studying building a bridge or underpass across Willow Road for pedestrians and cyclists. 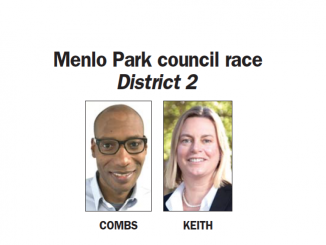 However, this project, despite its proximity to the abandoned Dumbarton railroad line, will remain separate from Facebook’s work with SamTrans to reinstate the railroad. Facebook is proposing to build the project in phases, starting on the southernmost portion of the site and moving northward, building a mix of housing, retail and offices in each of the stages. Phase One would consist of building 600 homes, a four-acre park behind the high school, the indoor community center, 10,000 square feet of retail, 600,000 square feet of office space, a 30,000-square-foot employee health center and 15,000 square feet of employee amenities in the campus portion of the village. Also, the first parking garage, with 1,250 spaces, will be built. Phase Two would consist of a 430-space parking garage for the public, up to 55,000 square feet of retail, including a pharmacy, and 600 apartments. This phase would also include constructing 600,000 square feet of office space, a second employee garage with 1,750 spaces and 15,000 square feet of employee amenities. The bicycle and pedestrian bridge or tunnel would also be built in this stage. Phase Three would consist of building the 200- to 250-room hotel, 110,000 square feet of retail — including the grocery store — 300 apartments and 600,000 square feet of office space. 14,674 employees, according to the city’s finance department. Creepy AF. The platform is creepy enough, and if you’ve ever visited the campus it’s even creepier. Now it’s spilling over into the neighborhood. Blind millennial idealism + techie entitlement, justifying exploitation of 1.74 billion unsuspecting users, invading their privacy, conducting nonconsensual behavioral experiments on them, etc. Facebook should be dismantled. Good thing we don’t have any traffic or gridlock problems or water shortages…. As much as everyone loves to hate FB these days, this looks like a well thought out expansion of an area that’s in dire need of help. I hope the homes have helicopter pads, because the only way they will able to leave home most of the day will be by helicopter. Willow Road is virtually gridlocked about 8 hours a day. We can’t handle more traffic on the east side. City Council should reject this project. Time for Facebook to move some (or all) of its employees to another location in the U.S. I hear Texas is a beautiful place to live with low taxes. We’re maxed out on the Peninsula when it comes to growth. There’s no room left. Move on, Mr. Zuckerburg.